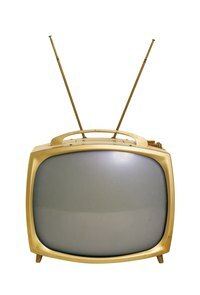 Televisions are common objects in most households; create a TV prop using a cardboard box to use for theater productions to complete the look of the set. The prop can be large or small, square or flat-screen. Arrange chairs and a coffee table near the TV to make the scene more realistic. Tuck in any loose flaps and tape the box closed. Paint the box black; cover it with two coats if necessary. Choose glossy paint to make the box shiny and look more like a television. Enlarge a still shot of a scene from a television show; make it as big as you want the TV screen to be. Find a screen shot online by searching for "screen shot" or "still shot" plus the name of the television show. Print the image and enlarge it on a copy machine, changing the size to fit your prop TV. Glue the picture to the center of the box. Roll narrow strips of aluminum foil into long, thin antennae if you're making an old-fashioned TV. Glue them to the back of the box so they stick up like rabbit ears. Cut a piece of clear plastic with the razor knife to cover the front of the television. Glue it in place by adding a dot of glue under each corner. Press it against the television over the top of the enlarged photo to make it look like a glass TV screen. Choose a box shape that closely resembles the size and shape of the television you want to create; use a shallow, rectangular box to resemble a flat-screen TV or a square box to resemble an older-style television.